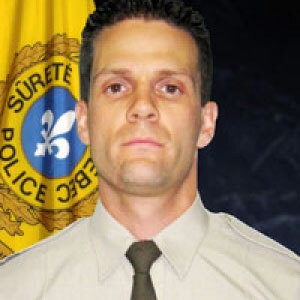 On Saturday October 6, 2012, a Sûreté du Québec officer died after he was hit by a passing vehicle while on duty near Bois-des-Filion. Cst. Donovan Lagrange, 33, was struck while walking back to his patrol car from two other vehicles he had pulled over in a speed trap. The accident happened at around 2:20 p.m. ET on Highway 640 about 25 KM northwest of Montreal. The nine-year veteran of the provincial police force was rushed to hospital in critical condition where he later died of his injuries Saturday evening. Our condolences go out to his wife, family, friends, and colleagues.